The mod is licensed under the MMPL-1.0, the source code is available on GitHub. Yes this means you have permission to add it to any public or private mod pack. Hi, was just wondering if the EU producer was included in the 1.9 version? I have TechReborn which uses EU and would really like to use Advanced Gen to power my machines, but I don't see a recipe for the EU port. There is no official IC2 API for 1.9 AFAIK. I'm not sure how to handle tech reborn, i'll look into it. Something like this but for energy? Using 1.89 I have a heat exchanger controller 2 fluid intakes(1 lava 1 water,) 3 heat exchangers, and 1 item output going to chest all that works and I am producing steam with 1 pressurized output. I have next to it but not connected 1 steam controller, 1 pressurized input, 3 manullyn turbines. My problem is I can figure a way to get pressurized output to the pressurized input. Any help would be appreciated. Pressurized input/output are for use with the pipes from pressure pipes mod. Ender IO turbines show up properly in EIO 3.0.0.19 alpha but updating Ender IO past that build causes the turbines to disappear. Additionally, advanced alloy turbines appear but do not have a recipe in addition to a missing texture. Updating to 1.9 is not viable for me at this time. 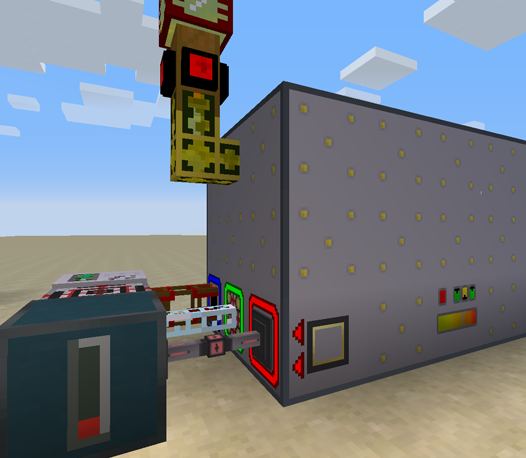 Advanced Generators v0.9.19.9 for Minecraft 1.8.9. IC2 v2.3.236-ex18. Item Output Port for the obsidian (might not work with some pipe systems and need a vanilla chest as a buffer for now, will be fixed in the future). Steam is not meant to be extractable from the syngas producer, it's only used internally. For some reason I'm having a tough time exporting out of the advanced generators in 1.9. I've tried using the two different pipes I'm familiar with, the RF conduit from router reborn and the neotech pipes, and been unsuccessful with exporting power. The generator works, it produces the power, the flux generator is installed and I used the workaround with the wrench to force output on both pipes but neither are exporting power. If anyone has any idea what I'm doing wrong please let me know. The output configuration tab on the machine has no options for either pipe. I've also looked at bdew.net and the energy output modules are all from mods that are not in 1.9 and the requirements here list 1.7.10 but I found this mod by searching 1.9 mods on the curse launcher. Not sure about RR but for NeoTech pipes - use any kind of wrench to rightclick the face of the output module where the pipe connects. It should get a color assigned and start working. As I said I did use the wrench workaround and you can see in my picture that the neotech pipe is under the generator with red arrows facing down, it is color assigned. I don't know why but it's not exporting from there. As you can see it is forced to export but isn't working. I've also noticed that I've had to rewrench it on every world load, is that intended behavior? No, you are right, something is wonky with manually forcing outputs... fix incoming. How is the performance these days 1.7.10? We had used this some newbie had like 20+ I think even used slightly wrong but was causing massive lag having so many multi structure generators going. I was considering adding them again but I always worry that there might be too many checks or whatever it was to cause lag again. Performance should be fine. Instead of running twenty, however, I suggest you look into increasing the maximum amount of turbines per generator. I also recommend CoFHTweaks, BetterFPS and FPSPlus. They help reduce lag in general. I've added a workaround for pipes that didn't work. Right clicking a face of a flux generator with a wrench will set that side to forced output mode, allowing it to connect with pipes that don't implement RF interfaces. I've also implemented IEnergyProvider with a working extractEnergy. Combined this should allow the mod to work with FR and NeoTech pipes. This is somewhat experimental, please report any bugs. Yes i'm using the official API. Fluxed Redstone cables don't work because they don't actually implement any of the RF interfaces on the TileEntity so they can't be detected. If you want a working power network use BuildCraft for now, it works correctly with AG.